Many advanced nations from Singapore to the US have open policies that allow people to migrate easily, bringing knowledge and skills to transform economies and create new jobs, a top Harvard economist said. 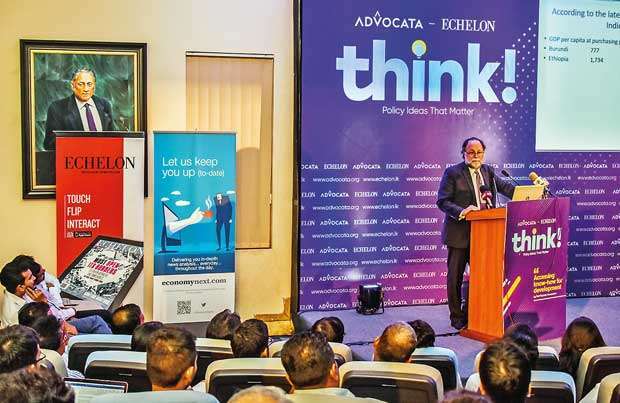 Allowing brains to move brings skills in faster and tends to have a multiplier effect in jobs and economic activity, Ricardo Hausmann, from the University of Harvard, told a seminar organised by Colombo-based Advocata Institute and Echelon Magazine. In the US, every foreign-born science, technology, engineering and mathematics (STEM) graduate was found to help create 2.61 additional jobs, Hausemann said. Technology is not limited to tools and codes/routines/procedures. These can all be easily transferred. What is difficult to transfer is tacit knowledge, knowledge embedded in the human mind through experience. Tacit knowledge includes insights, intuition and personal wisdom gained through experience. This is know-how and something that is difficult to extract and codify. Know-how takes a long time to acquire, like becoming a skilled surgeon or an anaesthetist. To carry out a successful operation, both are needed. Producing complex goods requires different types of know-how, which a single person simply does not have. In simple agriculture of a different age, a single farmer knew how to grow seed, cultivate, breed and look after buffaloes, make or repair his plough and produce his fertilizer. But in modern agriculture, where genetically engineered seeds, combined harvesters and fertilizer are used, he simply does not have the knowledge. An advanced society possesses a lot of know-how but it is in the minds of many different people. To produce a good team, people have to come together, like making a word out of different letters when playing scrabble. While some letters may be available, others are not. “So, if you are missing a letter, the other letters would become less valuable. So, you would give a lot to have this other letter. I like to say that an anaesthetist working on his own is not much better than a bad economics lecturer. The only thing he does is put people to sleep. So, if you bring different skills, you can make more things. They are complements, not substitutes. There are enormous benefits in different people working together. He said it is difficult to move know-how into brains. Author Malcom Gladwell had claimed that it took 10,000 hours (about 14 years) to learn, practice and acquire a world-class skill. “So, how do you move know-how? How do you get more know-how to Sri Lanka? We know it is difficult to put know-how to brains,” Hausmann said. Brains moved through migration, foreign direct investment and diaspora networks, when people who had originally migrated out, came back. Moving brains allowed a geographical region to move into entirely new products and keep boost productivity in established sectors, he said. In Sri Lanka, Camso-Loadstar, now a global solid rubber tyre company, was founded by a foreign national teaming up with a local partner. The US car companies Ford, GM and Chrysler were founded by people who worked for Oldsmobile. Oldsmobile was founded by a German who worked for Daimler-Benz. Silicon Valley was founded by 10 people who were hired from AT &T Bell Labs in New Jersey to Shockley Semiconductor. Eight broke away to form Fairchild Semiconductor. Ex-Fairchild workers then founded a number of other companies including Intel. About 57 percent of Silicon Valley workers are now foreign-born, 25 percent were out of state. “Only 18 percent were born in California, even though it has a population of 40 million, twice as big as Sri Lanka,” Hausmann said. Hausmann himself is originally from Venezuela. Sri Lanka’s IT sector is small and not growing as fast as the countries that had easier access to foreign talent. Wages were found to be lower in Sri Lanka than in India, he says. However, the IT wages are higher than in other sectors in the island. IT graduates could find work easily suggesting that skills were in short supply. Hausmann said Sri Lanka was a net exporter STEM workers. About 23 percent of engineering and science graduates and 20 percent of computer science graduates leave the country to work abroad each year, he said. The low inflow of foreign workers does not compensate for outflow, he said. An apparel manufacture in Bangladesh was pioneered by Desh Garments in 1977, in a joint venture with Daewoo, which took 126 workers of various disciplines to train in their country. By 1988, ex-Desh workers had set up 56 companies. The foreigners who move tended to create more jobs though the common perception was that they ‘stole’ jobs. In Singapore now, 45 percent of the population is foreign born. “People say we want to be like Singapore,” Hauseman said. “But they would not have gotten where they were with only homegrown ‘letters’. They had to attract ‘letters’. The foreign-born population of Hong Kong is 40 percent, he said. Stealing jobs or creating jobs? It is not just obviously technological degree holders that transformed countries, he said. Albania, an ex-communist state, had at once seen large scale migration into Greece. When the Great Recession credit bubble broke, hitting the Greece’s deficit-spending government and its economy, large numbers returned boosting Albania’s workforce by 5 percent. The people who went to Greece were supposedly low skilled. The standard argument goes that, if the workforce increased, unemployment would rise 5 percent or wages would fall. “Well, unemployment went down and the wages went up,” Hausmann said. Agricultural workers for example had worked in green houses. “They built green houses and hired neighbours,” he said. Panama had seen a spectacular boom in services, which was very skill intensive. The country had built special economic zones with tax holidays. The country wanted to attract international headquarters. But the investors who wanted to come wanted an exemption from immigration laws. “So, Panama has a horrible immigration policy, as bad as that of Sri Lanka,” Hausmann said. “They had closed the door on immigration but they opened two windows. People came in through the windows. “So, foreigners came in and there was a boom in construction and everything else and the wages of Panamanians skyrocketed,” he said. Still only 4.7 percent of the population is foreign-born in Panama. “It is one foreigner in 27. Not like one in seven in the US or one in two in Singapore,” he said. Sri Lanka could grow fast with immigration law reform, he said. Though the Board of Investment (BOI), companies were allowed to bring some foreign workers, their spouses are not allowed to work. Typically professionally qualified people married qualified people. They also cannot choose a different job after they come. There was no path to permanent residency or citizenship. It was much more difficult for a non-BOI firm to access foreign talent. Hausmann’s team had done a comparative study reviewing immigration laws of Hong Kong, Singapore, Indonesia, Thailand and Vietnam. They had also looked at Saudi Arabia. More economically advanced have sophisticated immigration systems that have moved from being systems that strictly authorised the entry of foreign workers, talent and capital, to systems that promote their entry, he said. They had a wide variety of visas for skilled, semi-skilled, trainees, managers and entrepreneurs. There were talent visas. He said immigration reform should be part of an overall effort to draw talent, foreign direct investment and export diversification. More visa categories should be created. If here is a path to residency, more skilled workers will come. He says immigration reform is a ‘low hanging fruit’ that can be implemented easily unlike infrastructure, which needs lots of money. “Sri Lanka may have the talent and the people for the current economy but does it have the talent and the people for the economy it wants to have?” Hausmann questioned. Sri Lanka is “weird”, he said because there is no path to citizenship unlike the countries that have become prosperous fast. Analysts say Sri Lanka’s immigration laws are even “weirder” than the people realize. Ricardo Hausmann is Director of Harvard’s Centre for International Development and Professor of the Practice of Economic Development at the Kennedy School of Government. He also teaches a capstone course on the MPAID programme. Previously, he served as the first Chief Economist of the Inter-American Development Bank (1994-2000), where he created the Research Department. He has served as Minister of Planning of Venezuela (1992-1993) and as a member of the Board of the Central Bank of Venezuela. He also served as Chair of the IMF-World Bank Development Committee. He was Professor of Economics at the Instituto de EstudiosSuperiores de Administracion (IESA) (1985-1991) in Caracas, where he founded the Centre for Public Policy. His research interests include issues of growth, macroeconomic stability, international finance and the social dimensions of development. He holds a PhD in economics from the Cornell University. The Advocata Institute is an independent policy think tank based in Colombo. Advocata conducts research, provide commentary and hold events to promote sound policy ideas compatible with a free society in Sri Lanka.